Macedono-Bulgarian Eastern Orthodox Cathedral Sts. Cyril and Methody Toronto Македоно-българска източноправославна катедрала "Св. св. Кирил и Методий"
Sts. Cyril & Methody Cathedral. ВРЪБНИЦА– ЦВЕТНИЦА. 6-та неделя на Великия пост. 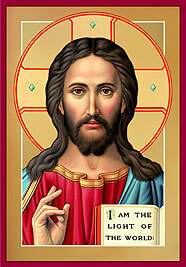 6th Sunday of the Great Lent. ВЕЛИКИ ЧЕТВЪРТЪК – Свето причастие и общ маслосвет. HOLY THURSDAY – Holy Communion & Holy Unction. 10:00 a.m.
ВЕЧЕРНА СЛУЖБА: Четене на 12-те Евангелия. EVENING SERVICE: Reading of 12 Passion Gospels. ВЕЛИКИ ПЕТЪК – Четене на Царски часове. GOOD FRIDAY – Reading of Royal Hours. 10:00 a.m.
EVENING SERVICE: Burial of our Lord Jesus Christ. 7:00 p.m.
ВЕЛИКА СЪБОТА - Василиева Литургия. HOLY SATURDAY – Liturgy of St. Basil – the Great. 10:00 a.m. Midnight EASTER Service. 11:30 p.m.
ВЪЗКРЕСЕНИЕ ХРИСТОВО – СВЕТА ЛИТУРГИЯ. EASTER - Divine Liturgy. Red eggs are distributed to the congregation. 0:30 a.m.
В Е Л И К Д Е Н.
EASTER. HOLLY RESURRECTION. 3:00 p.m.
EASTER MONDAY. HOLY RESURRECTION. 10:00 a.m.
EASTER TUESDAY. HOLY RESURRECTION. 10:00 a.m. It has been a tradition of our church to recognize our longstanding and active members, who have served the church for many years and whose contributions have had a big and lasting impact in the life of our Cathedral. This year at our Patron Saints’ Day Celebration, we have invited Helen and Hope Chicules to honour them for their many years of work and dedication to Sts. Cyril & Methody Cathedral. 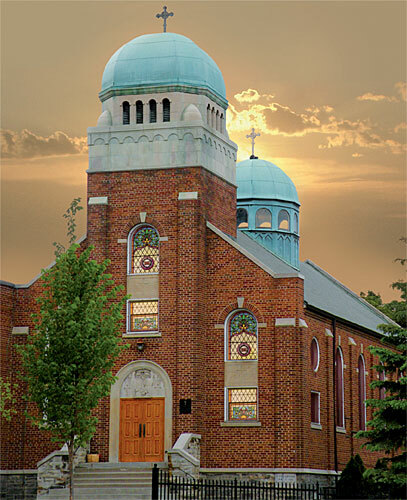 The connection of Family Chicules with the Church began in the distant 1912, when Helen and Hope’s father Eftim, then a 14 year old boy came to Toronto with his father Ivan. Later, Eftim brought his brother Michael with his wife Vasilka to Toronto. The family had 4 sons, one of which was James Chicules, known to us as the biggest sponsor of our Cathedral. Having established his business, Eftim went back to Macedonia, where he married Alexandra. Due to medical reasons, she had to go to Bulgaria and stay there for 2 years. When she arrived in Toronto, she brought from Bulgaria the recipe of a very popular dessert, called “revane”, which she gave it to the Ladies Auxilliary and it was used at the Bazaars with a great success. Eftim came back to Toronto and made the papers to bring his wife Alexandra here. When she came, they had their two daughters - Helen and Hope, who have been very involve with the church from the beginning. 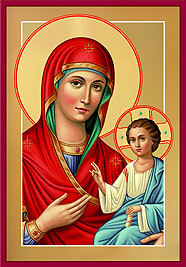 Helen was the first unpaid secretary with Father Haralampi Elieff, when the church was at Trinity Street. Later, when the church moved to Sackville Street, Helen and Hope Chicules continued to be very active in organising various events of the Youth Group and Ladies Auxilliary. Firstly, Helen took part in the Church Ladies Basketball Team, playing other churches. It was a big success and this story of our church appeared in a Government Archive for “Sports for First Generation Canadians”, written by Helen Chicules. Helen worked very hard to implement some of her ideas, which proved to be very successful in raising money for the church with the First Fashion Show in the church banquet hall. In 1964 to honour her both parents with a Special Panahida, Helen decided to serve coffee along with pastries. This was the first time coffee was served after the Church Service and has continued to this day, which is a legacy to remember. Later, at various Bazaars a Hand Bag Sale and a Hot-Dog Sale were very well received. Helen was the person writing Social Part of the Bulletin for Father Jordan Dimoff, especially organising a Dance, called “Getting to know You”, trying to get young people back to the church. She also helped with the mailing of the Church Bulletin. 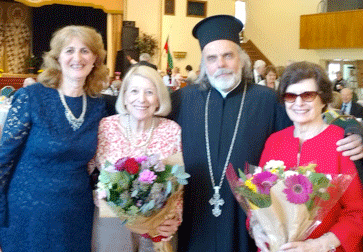 Helen and Hope worked very hard organising a Shower for raising money, when Father Dimitar Popov and Popadia Zlatka came to Toronto and later for the Celebration of their 50th Anniversary. They regularly helped at Bazaars and at Church Funeral Lunches, working as volunteer waitresses. In their devotion to the Church, Helen and Hope Chicules have never sought popularity and prominence. 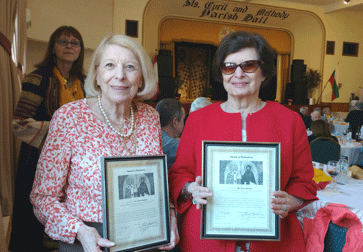 Over the years and to this day, Helen and Hope remain dedicated to St. Cyril and Methody Macedono-Bulgarian Orthodox Cathedral. The Church continue to play a strong role for Helen and Hope, as a place of belonging, a place to renew their spirits, a place to gather and meet friends, old and new, a place to be of service. Their faith, loyalty and commitment throughout their lives are good example to follow. Thank you Helen and Hope! May God bless you and grant you health and more years to come! May the Patrons of our Cathedra, the Holy Brothers Cyril and Methody guard and protect you always! On January 28, 2018, His Eminence Metropolitan Joseph has called a General Meeting of the membership for the election of a new Church Executive Committe. The meeting started with an opening prayer, performed by Metropolitan Joseph and Father Vesselin Arnaoudov, followed by detailed reports, presented by His Eminence Metropolitan Joseph, Parish Priest, Father Vesselin Arnaoudov, President of the Church Committee, Mr. Vangel Angelov and the Treasurer of the Church, Mr. Peter Evans. After unanimous acceptance of the reports and the assurances of all parishioners, who verbally declared that they would continue to observe strictly the By-Laws of the Cathedral and the Diocese, His Eminence declared the end of the canonical disorder and announced the beginning of the procedure for the election of a new Church Committee, which was held according to the requirements of the Church’s By-Law. Below is a picture of the newly elected Church Committee with His Eminence Metropolitan Joseph, Father Vesselin and Prezvitera Galya. Let us wish the members of the newly elected Church Committee to be healthy and to govern the life of the church with love, goodwill and wisdom. May our more than century old Cathedral affirm itself again, as a holy place for prayers, worship, peace and love among people.